Loox. The fourth dimension of furniture. Upvalue your product lines with Loox LED lighting systems: economical, future-proof and unique. Create emphasis, provide orientation and improve your customers' quality of life! The unique Loox driver with worldwide compatibility opens up all of the world's markets to you. Flexible use. More than ten switching and control methods, three amperages and well over 200 luminaires are available. For the best solution for your customers. Easier to install. Can be installed without specialist electrical knowledge. Just plug together and combine. Long lasting. Consistent quality from the market leader. A system that simplifies designing. With the Loox LED system it is easy to implement light ideas in a flexible, easy and reliable way. Experience the atmosphere of the light in the wide range of versions. 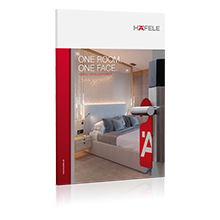 With Häfele Connect you can use your smartphone/iPhone or tablet/iPad to control all components of the Loox LED lighting system and many other functional fittings in your Smart Home.